Welcome! West Florida Community Care Center (WFCCC) is a place where people are provided help in learning how to manage their emotions and behaviors to improve their quality of life and live well in their communities. The campus is an 80-bed State of Florida treatment facility that is managed by Lakeview Center, Inc. As an inpatient facility, Lakeview provides intermediate care for people whose psychiatric symptoms can’t be stabilized in an acute care (shorter-term) setting. The average length of stay at WFCCC is approximately 90 to 120 days. We primarily serve people on an involuntary basis, using medications, behavioral and counseling therapies, education and individualized treatments. 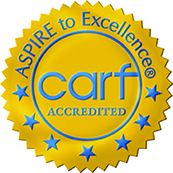 Lakeview Center is accredited by CARF in the following program areas: Outpatient Treatment, Out-of-Home Treatment, Residential Treatment, Prevention/Diversion, Detoxification, Day Treatment, Crisis Stabilization, Crisis Intervention, Opioid Treatment Program, Community Housing, Case Management, Assessment and Referral, Community Employment Services, Organizational Employment Services, Employee Development Services, and Comprehensive Vocational Evaluation. Lakeview will not deny services due to the inability to pay for services. Lakeview utilizes a discounted/sliding fee schedule to assist our clients with payment.